As I noted in my earlier essay More Reality Checks for Algal Biodiesel, I initially had high hopes for the idea that we might make significant amounts of biodiesel from algae. A few years ago I read Michael Briggs’ essay Widescale Biodiesel Production from Algae and thought he put together a compelling case that algae could power our transportation system. I even exchanged a few e-mails with him at one point in order to get a better perspective on his views. Ah, but the devil is always in the details. And as I dug into the details, my hopes began to fade. I had conversations with researchers who let me know what some of the problems were, and some were potential show-stoppers. 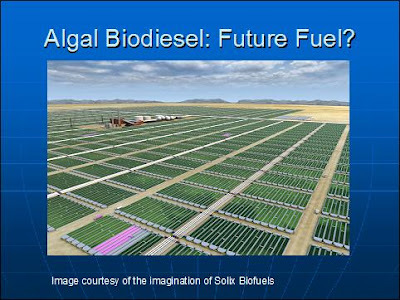 Krassen Dimitrov’s analysis of Greenfuel Technologies and their algae claims strongly suggested that photobioreactors (PBRs), as shown in the slide below from my ASPO presentation last year (Biofuels: Facts and Fallacies), have no future. Why? Because costs are about two orders of magnitude too high. More importantly, costs are tied to energy. That means that economic feasibility won’t come about if oil prices rise by one or two orders of magnitude. This is a show-stopper for the following reason. The amount of solar insolation falling on a square meter of land is known. The cost to build a square meter of PBRs is known. If, for example, a square meter of land might be expected to produce one gallon of algal biodiesel based on the sunlight falling on the surface, but the cost to build a square meter of PBR is $100, you have a problem. You can’t afford to spend $100 of capital to produce 1 gallon of biodiesel per year. (This is the thrust of Krassen’s analysis). My previous essay hit on this, as Bryan Wilson, a co-founder of Solix, recently suggested they could produce algal biodiesel at a cost of $33/gal (because of very high energy inputs). Now comes a new report commissioned by the British Columbia Innovation Council (BCIC) et al. to examine the viability of an algal biodiesel industry in B.C. The conclusions were not optimistic. The full report (88 page PDF) is Microalgae Technologies and Processes for Biofuels/Bioenergy Production in British Columbia. I note that my friend John Benemann contributed to the report (and 3 people wanted to remain anonymous). The study looked at photobioreactors (as seen in the graphic above), open raceways (something like a pond), and fermentors (as corn ethanol is produced). They estimated that the net cost of production per liter for PBRs was $24.60 ($93.23 US dollars/gallon), for open raceways it was $14.44 per liter, and for fermentors was $2.58 per liter. At least 15 companies are known to be pursuing the photobioreactor concept, mostly in Canada and the United States. There is no doubt that growing algae in photobioreactors is technically feasible since successful operations doing just that exist today. There are, however, serious challenges in making this process cost-effective for low-value products such as biofuels. So, before throwing your money in with a company working on PBRs, make sure it’s money you won’t ever need again. What about the value of sequestered carbon in algae-based biofuels? In short, there isn’t any. Atmospheric carbon is only sequestered for a short time until it’s burned in an engine. Under existing biofuels mandates in most industrialized countries, there will be no opportunity to sell carbon offsets unless fuel production is additional, or beyond such mandates. But the technology will surely improve? What about economies of scale or technology improvements? Economies of scale were considered in the analysis, using very generous assumptions. Some improvements could be made, including increased automation, genetically modified algae with higher oil yields and minimized light losses. On the other hand, the main components, such as concrete, glass and machinery, are unlikely to drop in price. Since there are limits to how much oil and starch algae can produce, the result is that photobioreactors can’t produce biofuels competitively today and are unlikely to do so in the future. It’s not slightly higher than fossil fuels, but by a factor of 10 to 15. These results may come as a surprise to many. They were, however, confirmed by a number of independent sources. The study, although intended to examine the feasibility of algae cultivation for biofuels in British Columbia, has yielded findings that also apply to other regions and worldwide. Sure, it’s in British Columbia, which is not the best place for year-round solar insolation. But double or even triple the amount of solar insolation and the economics don’t change enough to matter. So instead of producing biodiesel for $90 a gallon, you can produce it for $30. You still aren’t economical even if you could produce it for $5/gallon. The fermentation concept appears to hold some promise, but if sunlight is not the energy source you need some other energy source that the algae can convert into oil. That doesn’t seem especially efficient, but they claim an energy balance of 1.93 (I think they can forget about that 2nd decimal point!) against only 1.23 for the PBRs. Still, 1.9 is on the low side of desirable, given that society is currently running off of an energy return in the 5-10 range. In short, your argument is that fuel from bioalgae is too expensive but although it’s a good reason not to use the solution on a large scale right now, it is not at all a good reason to think it is not a sustainable solution. It’s perfectly possible to reduce the prices by an order of magnitude or two with technological improvement and economy of scale. Take any mainstream technology that was developed in the past 100 years and look at the price it had when it was still in development and I think you will understand why this kind of thinking is fallacious. No, the important thing is to understand why something is too expensive. If you are creating energy, and your problem is high energy inputs, then you have a problem that won’t be easily solved. That’s why 100 years ago there were commercial cellulosic ethanol plants that went out of business — and history is repeating itself today.